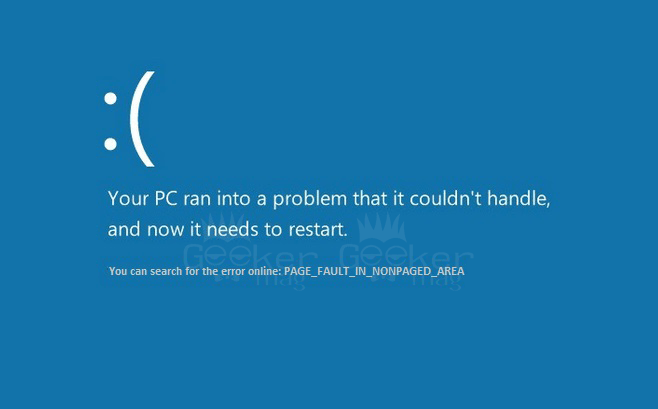 Want to fix error; Page_Fault_In_NonPaged_Area in Windows 10? In this post, you will read about all possible ways on how to troubleshoot the issue? If you’re running Windows 10, then there is no chance that you can hide from BSOD Errors. From the day the Windows 10 gone public, the users seeing various BSOD errors. Time to time I have tried to provide a solution to troubleshoot BSOD errors that are identified by me. In my previous post, I shared troubleshooting guide to fix KMode Exception Not Handled in Windows 10, the widespread BSOD Error faced by Windows 10. In today post I’m come up with solutions to troubleshoot another popular error named as PAGE_FAULT_IN_NONPAGED_AREA in Windows 10. Different users might be seeing different error message just like discussed above. There are lots of users facing the same BSOD error and looking for a possible solution. Right? After researching this bug, I finally figure out what causing BSOD Error PAGE_FAULT_IN_NONPAGED_AREA in Windows 10. So I decided to explain the issue with possible ways to troubleshoot the issue. The bug check for PAGE_FAULT_IN_NONPAGED_AREA appears with a value of 0x00000050. This represents that wrong system memory. Usually, it means that the address of the memory is wrong or the address of the memory is facing at freed memory. Installation of the faulty hardware (Normally relates to defective main memory, RAM, video RAM, or the L2 RAM cache). Installation of the faulty driver code. Installation of the broken system service. Third Party Antivirus Program can also cause the error. In the Start menu search bar type “Windows” or “Windows Memory Diagnostics” and when the same desktop application appears in the search result click to open it. 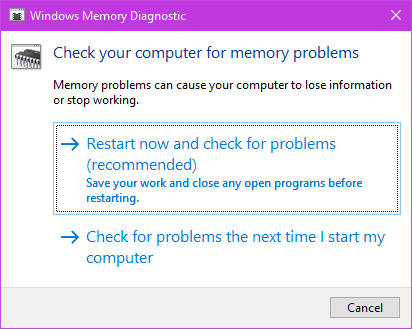 A small dialogue box will appear, here you need to click on the option named as “Restart now and check for the problems.” This will start the process to Diagnose Windows Memory. It can few minutes depending on the system. Search for Event Viewer app using Start menu search bar and open it. Here click on Windows Logs -> System. On the middle of windows look for the entry named as “MemoryDiagnostics-Results” to check the results. In case, you have installed any new hardware into the system recently try to remove it and check out if this fixes the issues. If the old hardware is causing the issue, then remove and replace a defective component of the system. You can also run a test to diagnose hardware problem. Every system has a different way to check it out. You can check the manual of the system or search the web. Alternatively, For ease, there are lots of hardware diagnostics tools for Windows 10 available on the internet. You can download the one and perform the test. In case, you have recently installed any service on your system try to disable it and check out if this fixes the issue. If it does, then contact the manufacturer of the service and ask for the possible update. In case, the error appears during the system startup; then you can examine the issue with the help of Windows repair options. Why don’t you check out all the Windows 10 recovery options? Type Add or Remove Program in Windows 10 Start menu and when the same appear in the search result click to open it. Here on the right side look for an antivirus program and click on the Uninstall button to uninstall it. In case, the antivirus is causing the issue; you can visit their support center and discuss the issue for a possible solution. For that, first, you need to reboot your system. After that run elevated command prompt and type Chkdsk /f /r and hit enter. This will start scanning the disk on a system partition. In case, you see WinFsf.sys or SRTSP64.SYS at the end of the error message, then recently installed Norton Antivirus is causing the issue because it is a Symantec critical system and device drivers file. So try to uninstall and contact Norton support. It is driver files belongs to Cupid’s CPU-z Program, but in most of the cases when PAGE_FAULT_IN_NONPAGED_AREA in Windows 10 appears with this message, then it is caused by Speccy program installed on the system. In this situation, it is highly suggested to update the Speccy. If the issue still persists then uninstall it from the system and download the latest version and install it. This file belongs to ON/OFF program developed by Gigabyte. To get rid of this error simply update the program to the latest version or uninstall it, if it is lying on your system for nothing. Update the Audio driver with the latest one available. Press WIN + X to open WINX menu and select Device manager. Right-click on the “Audio and Input and outputs” and select Update Drivers or Uninstall Drivers. The process to fix PAGE_FAULT_IN_NONPAGED_AREA is not complicated, but tricky because it can happen due to bad drivers, hardware, or software. So it is a good idea to check out the brackets next to the error message. As the error message explains what file is causing the issue. I hope you find this troubleshooting guide to fix the error PAGE_FAULT_IN_NONPAGED_AREA in Windows 10 useful. Let me know your thoughts in the comments.